The Ottawa Senators have reassigned forward Darren Archibald and goaltender Filip Gustavsson to the Belleville Senators of the American Hockey League. Roster update: The #Sens have re-assigned forward Darren Archibald and goaltender Filip Gustavsson to Belleville (AHL). Mise à jour alignement : Les #Sens ont cédé Darren Archibald et Filip Gustavsson à Belleville (LAH). The Winnipeg Jets have reassigned defenceman Tucker Poolman to the Manitoba Moose of the American Hockey League. #NHLJets reassign Tucker Poolman to the @ManitobaMoose. The St. Louis Blues have placed defenceman Carl Gunnarsson on injured reserve and have recalled Sammy Blais from the San Antonio Rampage of the American Hockey League. Gunnarsson has not played since February 5 and has appeared in 18 games this season with the Blues, recording three goals and four assists. Pittsburgh Penguins coach Mike Sullivan says Casey DeSmith will start in net on Sunday against the New York Rangers. DeSmith replaced Matt Murray in the third period of Saturday's 5-4 loss to the Calgary Flames. The Florida Panthers have announced that goaltender Roberto Luongo will be away from the team on bereavement leave. They have recalled goaltender Sam Montembeault from Springfield Thunderbirds of the American Hockey League. 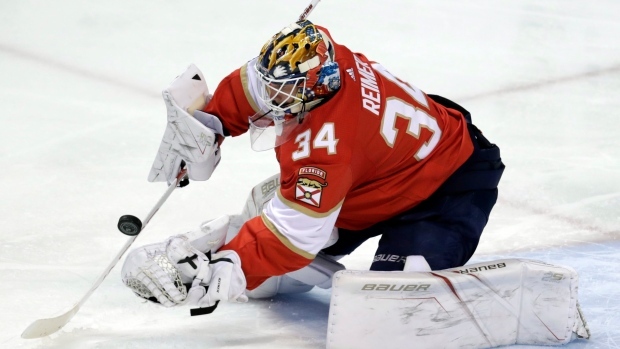 #FlaPanthers recall goaltender Sam Montembeault from @ThunderbirdsAHL, Goaltender Roberto Luongo away from Panthers on bereavement leave. James Reimer will start in Sunday's game against the Montreal Canadiens.